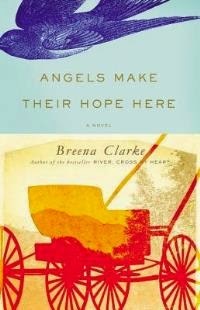 Although Breena Clarke has previously written two highly regarded historical novels – including an Oprah pick, River, Cross My Heart – her latest was my first experience with her work. Based on the author's research into legends of the Ramapo Mountains of northeastern New Jersey, Angels Make Their Hope Here hones in on a secluded pocket of civilization called Russell's Knob, an imagined setting whose racially mixed residents – blacks, whites, Indians, and their "jumble children" descendants – live in harmony and fiercely defend one another against outsiders. The perspective shifts among a medium-sized cast of characters, much like a camera might pan across a scene. Although the effect could be jumpy and awkward in a less skilled writer's hands, the transitions feel remarkably seamless here. In 1849, Dossie is a young dark-skinned girl who was sent north from Maryland along the Underground Railroad by caring relatives. Unfortunately, she had fallen into the hands of an unscrupulous ring of people who worked her like a slave. That is, until a man named Duncan Smoot, who was to be her next conductor along the line, burns her captors' house down and secrets her away to Russell's Knob in the mountain highlands. One poignant image of her first night in her new home sees Dossie stretched out “in a comfortable curl on the well-worn floor,” refusing to acknowledge the possibility that she has a bed of her own. Over the next decade or so, as she adjusts to her new circumstances, she cares for Duncan's chickens and keeps his house tidy while becoming part of his extended family: his sister Hattie, her German-born husband, their son, his handsome cousin, and the local spirit woman. Taught to read and write, Dossie grows into young adulthood hoping Duncan, whom she idolizes, will come to see her as a woman worthy of his attention. In this era of racial strife and intolerance, however, whites and white-only locales pose a grave danger to the safety of Russell’s Knob. As the plot moves forward and occasionally back in time, Clarke reveals several jaw-dropping back stories for Smoot family members. And when the realities of being a black woman in a white-centered world hit Dossie in a very personal way, she's forced out of Russell's Knob and into New York's notorious Five Points district to save herself and her loved ones. Rather than drawing readers carefully into her story at the beginning, Clarke drops them headlong into her characters’ thoughts and actions. I found it hard to situate myself at first, entranced by the rich setting and folksy dialect but unsure of exactly what was happening and what everyone's role was. Everything coalesced several chapters in, though, and I came to appreciate her nuanced characters. Each of them has faults, sometimes major ones, but also many redeeming qualities. Dossie is an impressionable and sensual young woman who doesn't understand her power initially, or the effect her beauty has on other people. Her circumstances force her into emotional maturity by the end, and as a coming-of-age tale, the novel is effective and satisfying. More than that, though, Angels Make Their Hope Here is an empowering story about community, self-realization, and freedom of choice, something every person deserves. The novel was published by Little, Brown on July 8th in hardcover ($26.00/C$29.00, 275pp). Thanks to the publisher for providing me with an ARC. I'm sympathetic to the argument that our country can't afford to take care of everyone, but still, the reference to the Underground Railroad here made me think of the current immigrant influx at the border. I can see some similarities, in that parents are sending their child north, alone, to what they hope is a better and safer situation. I'll bet this would be a great book for a book club and discussion. Terrific review. Thanks, Holly - I agree that it would be a good one for discussion. There are some plot points that happened later in the book that I'd be interested to discuss with other readers. I love writers who can move back and forth through a malleable timeline skillfully like this. Dialect is sometimes a bit difficult for me too. She handles the dialect well, not overdoing it but providing just enough to give readers a flavor of what it sounded like.